It was a successful court case brought by Verizon that resulted in ISPs not being regulated under Title I of the Communications Act of 1934, but the judge noted, if the FCC wishes to ensure a fair playing field, it would be better if they regulated ISPs under the even stricted Title II, a decision which the FCC agreed. New Zealand: "Home of the planet's most worthless bird." F.37: Picture of a birthday cake. "C," 100th EPISODE. I admit having a bunch of projects called something like "lawsuit quest V - Glass Candy" when something sounds suspiciously too close to something else. I did sign in and express myself on this. Sometime before the site crashed, but it did take awhile as it was already bending under the traffic. 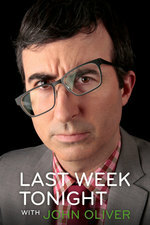 John Oliver's ability to turn insults directed at him into grist for his own comedy is priceless. Any bets on how long Joe Scarborough and Mika Brzezinski will last as an item? Because Christ Almighty, they seem like That Couple whom their friends have lunch with, rather than inviting them to dinner, in order to see them separately. "Negged by WBUR" had me giggling. Me too! It's such a hilariously subtle burn.